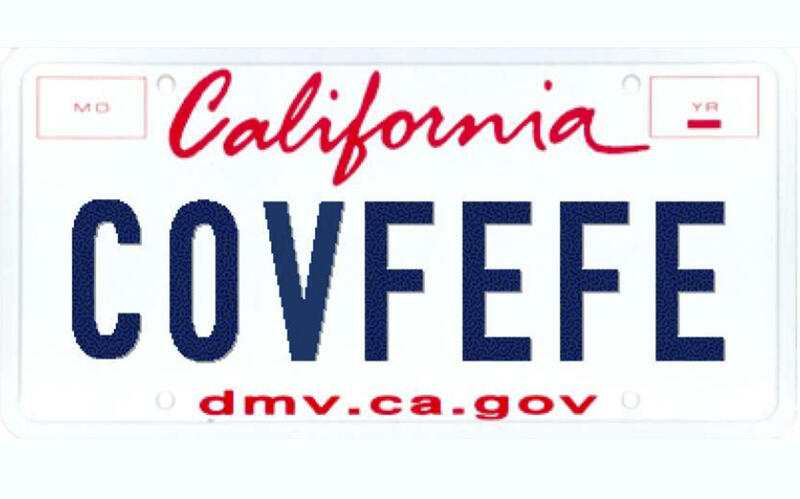 LOS ANGELES -- President Donald Trump's mysterious "covfefe" tweet has inspired a vanity license plate in California -- and elsewhere across the country, CBS Los Angeles reports. The California Department of Motor Vehicles' website confirmed that a personalized plate with the term is unavailable. It remains unclear when the California plate was ordered, but personalized plates with the term have been claimed in other states as well. The Maine Department of Motor Vehicles confirmed that someone claimed "covfefe" for a personalized license plate just hours after Mr. Trump's now-infamous tweet at 12:06 a.m. Wednesday. Local media report that it's also happening in other states, including Nebraska and North Carolina. The word took social media by storm after the president tweeted about "constant negative press covfefe." Mr. Trump later poked fun at it, saying, "Who can figure out the true meaning of 'covfefe'?" Twitter user Joe Blanchette tweeted a photo suggesting he was the lucky motorist. But he says he balked at the last minute out of fear of "plate regret."